The Galaxy Note 2 from Samsung continues to define the word 'phablet', which is a class of mobile devices that blur the line between tablet and phone and offer a completely new user experience. While the Galaxy Note 2 is big (perhaps too big for some), this phone is stunning in many ways with pioneering cell phone functionality and calls for big user adjustments. The Galaxy Note 2 has striking resemblance to the Samsung Galaxy S3. You essentially have seen the Note 2 if you have seen the Galaxy S3. The Note 2 has the same round corners, scant bezels, glossy surfaces and bubbled-out screen of the Galaxy S3. Add a stylus and magnify the S3’s size and you’ll have a Samsung Galaxy Note 2. The Note 2 is 3.25 inches wide, 5.75 inches long and slightly under half an inch thick, making it probably the largest smartphone you have ever seen. At a mere 6.45 ounces, it is comparatively thin and light weight despite its large size. The Note 2’s width, however, is wide enough to make it a little hard to grip in one hand and fit in the pocket. The Note 2 features a large 5.55 inch HD Super AMOLED screen, which is a benefit that comes with the phone’s large size. The AMOLED display gives vibrant colours and deep blacks viewable from wide angles. Texts are also clear and sharp whether it is handwritten memos or printed text. The Note 2’s 1,280x720 pixels AMOLED screen has the same resolution as the Galaxy S3, but a diagonally wider display means it has a wider screen aspect ratio, which translates to a resolution that is not as sharp as the Galaxy S3's. Nevertheless, media enthusiasts who like their phones with larger screens will still love the Note 2. The Galaxy Note 2 comes with a 4G LTE-optimized, 1.6 GHzquad-core Exynos 4 processor, a high-performing 8-megapixel camera and an S Pen. The Note 2, similar to the Galaxy S3, also comes with 16GB, 32GB or 64GB storage space with up to 64GB of external storage and 2GB RAM. A 3,100mAh battery promises to give 10 to 12 hours of life, according to the specs sheet. 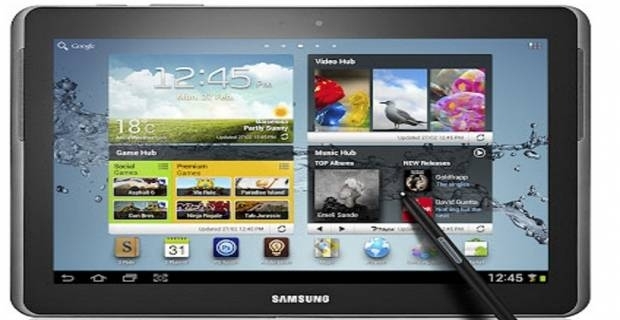 Packed with a host of powerful features, the Samsung Galaxy Note 2 is an outstanding mobile device. If you can live with a phone that's big enough to barely fit in the pocket with pioneering functionalities and leading tablet features, then the Note 2 is your kind of phone.